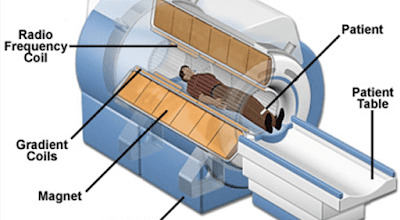 Magnetic Resonance imaging or Nuclear Magnetic Resonance (NMR) is a medical imaging technique which is commonly used in radiology to visualize the internal structures and functions of the body. An MRI scan is a technique that uses magnetism, radio waves and computers to produce images of body structures. Unlike other imaging techniques it uses a powerful magnetic field to align the nuclear magnetization of hydrogen atoms in water in the body. It provides high quality 2-D or 3-D images of organs without using X-rays or any other radiations. The magnet creates a strong magnetic field that aligns the protons of hydrogen atom, which are then exposed to a beam of radio waves. The technique is based on the principle that when the hydrogen atoms of water molecule are subjected to a strong magnetic field hydrogen atoms release protons. That is when a person goes inside the powerful magnetic field of the scanner, the magnetic moments of these protons align with the direction of field. 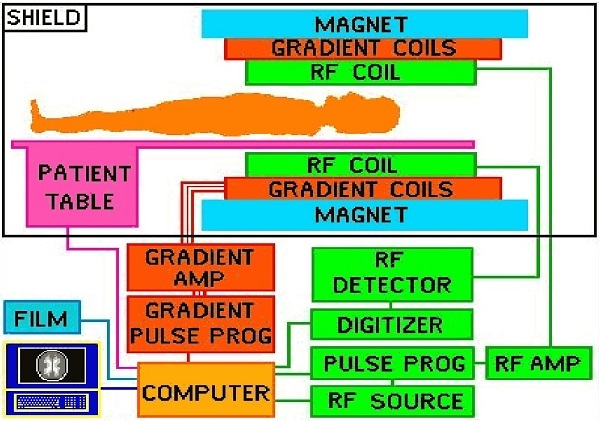 The magnet is the largest and most expensive component of the scanner. Different magnets such as permanent magnet, resistive electromagnet, superconducting electromagnet etc can be used. Magnetic field strength is also an important factor because as the magnetic fields increases the signal-to-noise ratio also increase which results in higher resolution of the image. An RF electric field is then turned on which causes the protons to change their alignment relative to the field. Again when this field is turned off the protons return to the original magnetization alignment. By applying additional magnetic field during scanning, the position of protons in the body can be determined and it allows an image of the body to be created on the computer. MRI can be particularly used in detecting tumors in tissues because the protons in different tissues return to their equilibrium state at different rates. By manipulating the return rate, the affected tissues can be distinguished. An MRI scan is a pinless radiology technique that avoids the terror of X-ray radiation exposure. The MRI scanner cutaway is shown. The different components of the MRI system are briefly explained below. 1. Magnet: In MRI system there is a magnet which is provided for a strong uniform steady magnetic field. Now superconducting magnets are used commonly. The superconducting magnets can provide better Signal-to-noise ratio and better image quality than the output obtained through conventional magnets. • Surface coils are the simplest which are commonly used for spines, shoulders and other relatively small body parts. • Paired saddle coils are commonly used for imaging of knee. These are also used for the xand y gradient coils. • The Helmholtz pair coils consist of two circular coils parallel to each other. They are commonly used as the z gradient coils in MRI scanners. • The fourth type bird cage coil can provide the best homogeneity of all the RF coils. The name implies that it has the appearance of a bird cage. This coil is commonly used as the transceiver coil for the imaging of head. 3. Gradient coils: Gradient coils are of so importance as they are used to produce deliberate variations in the main magnetic field. There are usually three sets of gradient coils one for each direction. We have to vary the magnetic field because it permits the localization of image slices, phase encoding, frequency encoding etc. Changing magnetic field induce electrical currents in the conductor. The block diagram of MRI hardware is shown below.